The Peake’s Quay Marina Retaining Wall was built in 1990 as a tied timber lagging retaining wall wharf structure. The wall consists of steel H‑piles spaced at 2.5 metre centres with tie‑backs to concrete deadman anchors. 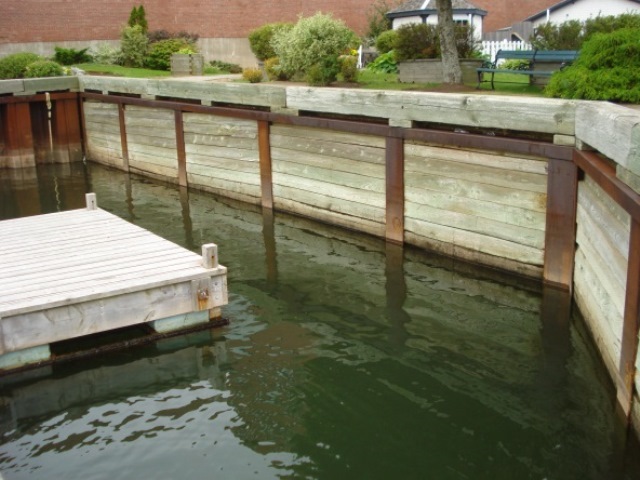 Concrete panels span between the H‑piles below low water level, while the upper portion of the wall uses timber lagging. 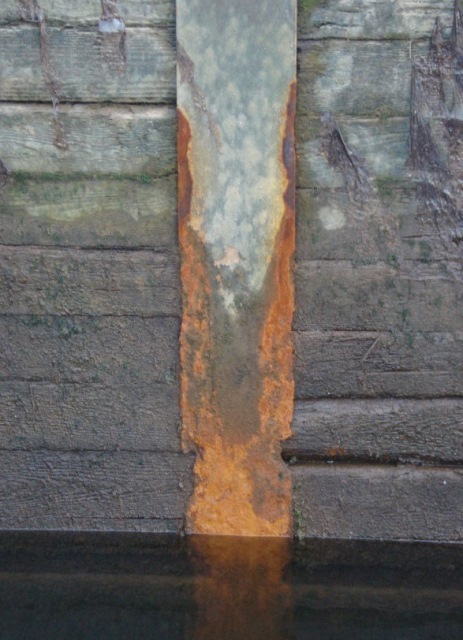 The water side flanges of the H piles have suffered severe corrosion and abrasion in the tidal zone, up to an average of 0.4 mm loss per year. HEC was approached by the Charlottetown Area Development Corporation (CADC) to provide repair details for the water side face of the piles. During the repair design, HEC coordinated an inspection of the backside of one pile to verify the corrosion rate on the buried flange and web, and also the condition of the tie back rod and connection. HEC was confident that the corrosion was primarily on the water side face of the flange, where the steel is exposed to abrasion and cyclical wetting and drying in a salt water environment. HEC performed a global structural analysis to determine overall stability of the structure along with loads in the H‑piles. A repair plate detail was then designed to be welded to the waterside flange of the pile. The details were developed under consideration that this work would be done by divers experienced in underwater welding. The repair plate was fabricated with slots along its centre. The slots were then plug welded to the flange of the existing pile, allowing the repair plate to effectively resist bending stresses in the pile. A skid plate was welded to the face of the slotted plate to protect against ice abrasion. Finally, sacrificial galvanic anodes were installed to protect the repair plate against corrosion. To deliver a high quality finished product, special attention was given to developing specifications that would ensure high quality underwater welding.